This is a guest contribution from Paul Zubrinich of Little Web Giants. 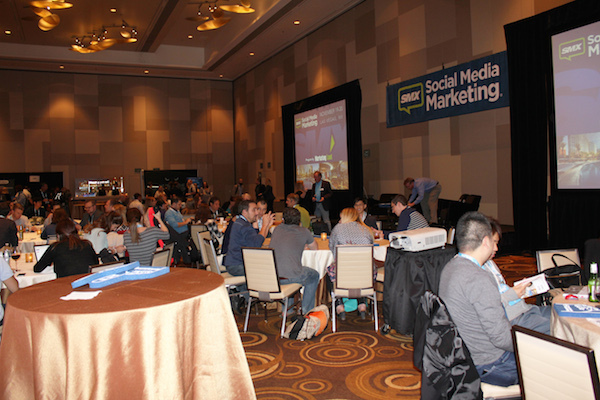 Late last year, I returned from the biggest social media marketing conference in the world, SMX Social in Las Vegas. There were experts from all fields of social media and a wealth of new ideas floating about. Here are some of the takeaways. Think about this scenario. Someone discovers your business through Facebook and likes it. In the coming months they notice a few of your posts and engage with a couple of them. A few months later, they Google your business and convert to a buyer. Now in your web analytics, the conversion is falsely attributed to Google organic search, even though Facebook was the first point of contact and crucial to the sales cycle. Due to this realisation, marketers are moving toward measuring ROI based off more factors than just the last click. If you only measure by the last click, it is like measuring each player on a footy team by how many goals they kicked, thus neglecting the contributions of the backline and mid-fielders. The takeaway for SMEs: Measure engagement – it has value! Tone down the “buy now” rhetoric! You know the guy. He clomps into every online conversation, selling. All of his posts are so promotional that they make infomercials look subtle. Imagine if he went to a business conference and in every conversation he was just telling people how good his product or service was. This is no way to build trust or make friends. On social media, the soft sell is the best way to win people over (and reach their News Feeds). An oft-recommended strategy is to apply the Pareto principle: 80% of your posts should be informative and 20% can be promotional. This article is an ideal example. I am sharing information without loading it up with my own sales spiel. I will embrace the day when people abandon those memes saying the “best time to post”. Imagine you sell UV lamps and one of your target demographics is people who work night shifts. You read one of those blog posts that says mid-afternoon is the ideal time to post on Facebook. But your target demographic is in bed then. What about a fast food place that targets young students up late at night? Post in the evening. Go for it. The takeaway: Know your demographic and meet them on their terms. There is a wealth of tools out there for discovering when your followers are online. Facebook has Insights, Twitter and Pinterest have Analytics, and Simply Measured offers analytics tools for LinkedIn and Instagram. No matter what social network you are using, find out about your followers and your target market, rather than settling for population averages. It will put your posts in front of more potential customers. The future of social media will not be built on one-size-fits-all strategies. You must know your target market. Track your outcomes and do more of what works and less of what doesn’t. Take part in the conversation with a more human tone. Show you care about your customers. Now get active and join the conversation! Did you follow #SMXsocial on Twitter? Do you have any other tips to share or questions for the author? Paul Zubrinich is co-founder and head of online marketing at Little Web Giants, an internet services firm. He blends a skillful mix of strategic search engine marketing, conversion rate optimisation, content marketing and pay-per-click advertising. He has worked with clients from fields as diverse as the solar photovoltaics industry, environmental advocacy and the health and beauty industry. He won Marin Software’s Biggest Social Geek contest of 2014 against over 2,300 social media marketers worldwide.